If I knew that it was so easy to make mercury glass, I would have done it a long time again! After seeing this cloche with a mercury glass base at Pottery Barn store, I decided to try it! There are many tutorials on making mercury glass but they are all basically the same. I used a spray bottle of 1/2 vinegar and 1/2 water. 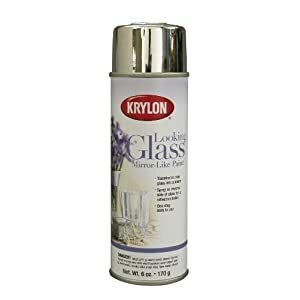 I also purchased a can of Krylon Looking Glass paint from Amazon. I was unable to find it anywhere locally. I checked Home Depot, Lowes, Ace Hardware and Walmart and no one had it! After cleaning my glass pieces and drying them thoroughly, I sprayed a fine mist of the water/vinegar picture and then light sprayed over it with the looking glass paint. I sprayed another fine mist of the water mixture. After a minute or two, I used a paper towel and lightly padded it on the glass. It lifted some of the finished, giving it the desired effect. So easy, so simple! I did have a little trouble with the taller cylinder vase because I was trying to do the inside but kept having trouble so I just applied the finish to the outside. Here’s a close-up of the base. I love how it turned out! I also made the moss ball with reindeer moss from the Dollar Tree and an old decorative ball that I had. I found the little votive cups at GW and painted them too! They made a nice edition to the mantel! I have been a little sluggish in getting areas of the house decorated after all the Christmas decorations came down. I’ve finally got it done and before we know it, it will be time to decorate for spring! Oh wow! I've never heard of this paint b4 either. I want some! This seems like such a fun craft with such pretty result I just have to try it too. We just marked down a lot of clear cylinder glass containers at work so I may just have to buy one and give this a try. I just love your cloche, it's beautiful! Thanks so much for sharing! Great idea! I'm sure I've seen it at HL. I had to restrain myself, too! When I finished these pieces, I was holding the can in my hand and I thought, "What else can I do?" LOL! I made myself stop! Have a blessed week! I have been wanting to try this. I love it on the cake stand! Such acute idea! Your fleur de lis basket is wonderful too! Wow that looks like the real thing! So pretty I need to try this!Your projects look beautiful! Your nature items combined with the mercury glass are really pretty together. I love moss balls and glass. This came out great, it looks so really. Great job! You go girl! This looks so pretty! So you applied it to the outside! I have only seen it applied to the inside of glass.....did you use a sealer? Hi Karianne, I didn't use any sealer. After it dries, it feels smooth to the touch. I rubbed on it and it stayed put! Have a blessed week! I love the look of mercury glass. Now that I see it is so easy I should just go for it. Thanks for giving me that extra push to go for it! I really appreciate your tip on ordering that spray from Amazon, I bought some silver mirror paint at Christmas time but it is not the same. I would love to try this, Thanks! Your decor looks great, and yep, spring is just around the corner! Hey, Tammy! I had no idea it was so hard to find that glass spray paint in some places. It's EVERYWHERE here! I have contemplated buying it from time to time for other projects, but never did. You should tell those people at your local store that they should carry it. That's crazy that they don't! I'm sure you would just have a heyday making all sorts of projects!!!!! You did a great job here! Terrific job on the moss ball, too!!! I want to try this, too! Thanks for making it sound easy! Hugs! Love .. have got to give this a try! This is beautiful! I didn't think about trying it on the outside of the glass. Great job! Hi Tricia! Spraying the inside of the taller cylinder glass was just so difficult! I said, what the heck, I'm gonna do it on the outside and it worked well! After it dried, it was very smooth to the touch and did not come off. I even tried scratching it with a fingernail! Have a blessed day! I've used the Krylon stuff, too and I like it! Great idea to do the small votives! Isn't this the coolest stuff ever? I bought about 11 of the PB MG votives before Christmas and spent a fortune!! Wish I had known about this then! Everything looks so pretty!!! I'm a cloche nut too lol. I have found the Looking glass paint at Hobby Lobby but it seems to go really quick especially if they have a sale. I got mine from our co-op Ace hardware about 5 miles away. They had to order it and now have more on the shelves.